Directed by Andrew Fleming. 2018. USA. 90 min. 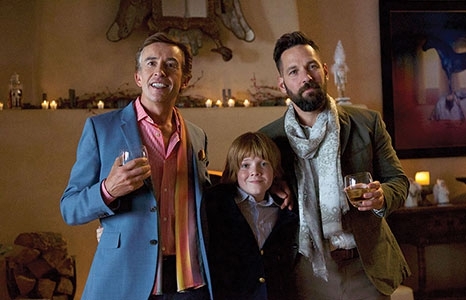 When his grandson shows up at a high class dinner party one evening, Erasmus Dickie Brumble (Steve Coogan) and his filmmaking partner (Paul Rudd) reluctantly take him in. The bickering couple face many challenges as they try to adapt to this new addition to their extravagant home. The boy won't cooperate—he only eats Taco Bell and they don't even know his name! Written and directed by Andrew Fleming, this dramedy is a sweet and funny tale that explores what makes a family. With hilarious cameos from Allison Pill, Kate Walsh and Drew Droege, this film is sure to charm your pants off! Opening Night Reception: Before the film, enjoy a reception hosted by Zach’s Event Catering in the Luce Pavilion. Doors open at 6pm. Film starts at 7:45pm. Directed by John Sheedy. 2017. Australia. 16 min. Having always felt like he was born in the wrong body, 10-year-old Tom chooses the name Mrs. McCutcheon rather than the name he was given at birth; he also prefers the flow of a dress rather than the cut of a pant. Now at his third school, Tom is having trouble settling in and finding acceptance from his newfound peers—except for Trevor, a tough little charmer who also suffers from prejudice due to his Aboriginal heritage. With the school dance only days away Tom is thrust on a journey of self-discovery and sacrifice in the daunting quest to find his place in the world. Be prepared for a courageous ending that might just revolutionize school dances forever! Winner of the Best Australian Short Film Award, Best Cinematography, and People's Choice Audience Award at the 2018 Melbourne Queer Film Festival.